Military authorities have revealed that the Nigerian army has completely defeated Boko Haram insurgents in the country. The Theatre Commander of Operation Lafiya Dole, Major General Rogers Nicholas said this on Saturday during the inauguration of the Nigeria-Cameroon military joint mission in Maiduguri, Borno State capital. 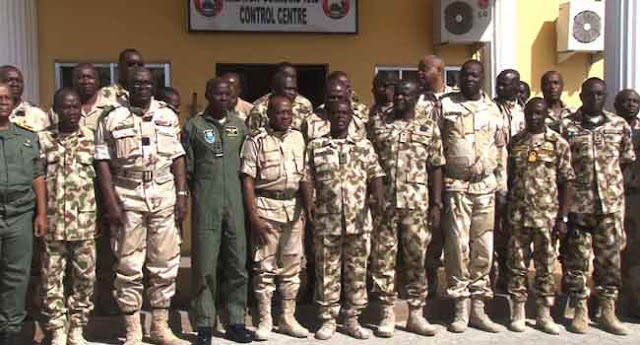 “My soldiers are in the heart of Boko Haram enclave that is Camp Zairo. The gallant troops have taken total control of Sambisa forest. We have broken the heart and soul of Shekau’s group, taking over the camp and its environs. “They are on the run and we are pursuing them to wherever they go. This time around there is no place for escape anywhere,” he said. He said further that hundreds of insurgents had surrendered, several others fled, and over 100 civilians were rescued. The theatre commander also challenged the fleeing insurgents and abducted persons in the bush to come out and surrender to the troops, promising that they would not be harmed or killed. Speaking concerning the meeting with the Cameroon joint mission, Nicholas said that the collaboration between the two militaries was critical to the successful completion of the counter-insurgency campaign. “We share information and intelligence to enable us to map out strategies to fight Boko Haram insurgents in our common borders,” he said.